The road to Ellesmere wasn’t entirely trouble free – a motorist running into a bridge at Gobowen made sure of that – but for a Friday afternoon things turned out quite well. Rolling into Shrewsbury station, a mere 10 minutes away from Gobowen, the guard announced the train was detouring direct to Crewe. That left us on the station platform watching the ensuing confusion while the iPhone Map and National Rail App came up with an alternate station and the next train there. The back lanes from Wem were delightful and we rode into Ellesmere entirely relaxed. Nobby, Dave and Peter had ridden in from Whitchurch a little earlier and we checked out the route options for Saturday over a meal and a pint. 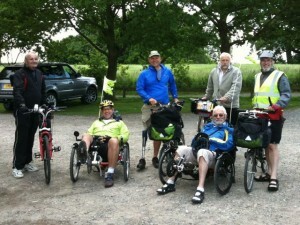 With Tim and Frank joining us on their trikes in the morning, the magnificent seven (Calamity Brigitte is behind the camera) set off for a ten mile loop of lanes, meers and canals. This entry was posted in Inclusive Cycling Forum and tagged bikes, disability, mobility, ride, words on Mon 14 Jun 2010 by kevin hickman. What a cracking day for a bike ride! Seven of us assembled at the front of the youth hostel on Saturday morning, five had arrived the day before, Mai Ling came out on the train to meet us, and Jim, ever the canny accountant, made the most of his travel card to get part way out of London by train, riding the rest of the way. Only one trike out – Ruth’s new Mission Space Genie – Lee Valley Park proving to be a good traffic free area to get more familiar with it. Unfortunately, the ensuing logistics of an aborted camping trip the previous week left nobby and myself arriving by car with Brigitte and folders rather than by recumbent trike. Roger (not pictured – on another lap of the park!) also arrived on Friday afternoon having ridden all the way from central London. 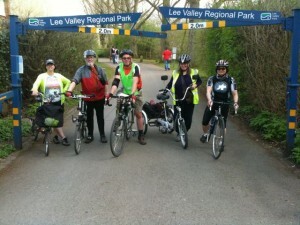 This entry was posted in Inclusive Cycling Forum and tagged bikes, disability, london, meeting, mobility, ride, words, yha on Tue 13 Apr 2010 by kevin hickman.